Glory has been added by Mercedes-Benz and McLaren to their SLR family with the brand new SLR Stirling Moss super sports car. The car is designed with an advanced technology which has produces an output power of about 650 bhp and the supercharged V8 engine, which attains a speed of 60 mph in just 3.4 sec, which runs at a top speed of 217 mph. The cost of purchasing this car will be around $1,000,000 and it is limited to 75 units with unique numbers from 1-75 on each car. The car contains no roof and widescreen, where two wind deflectors are placed in two centimeters height to guard the driver and traveler from the flow of air. In addition, two air scoops have been included in the body which act as roll over bar. 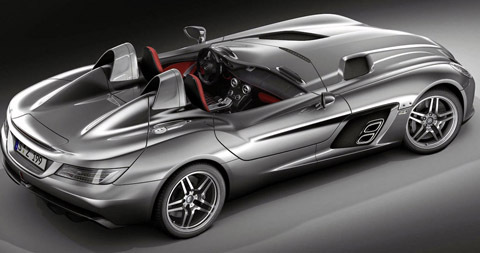 Due to this concept, the SLR Stirling Moss is completely different compares to other sports cars. The body of the SLR Stirling Moss is made up of carbon fiber that looks in an arrow shaped and muscular form. The interiors and exteriors are finely designed due to the absence of windscreen. The air scoops located at the back of the driver and traveler is another major attraction which carries a roll over bar. The aerodynamic concept is the only thing that unites SLR Stirling Moss with the other models of the SLR. It is provided with a diffuser at the back bumper and a closed under-body. The diffuser used in the SLR Stirling Moss is comparatively larger than the roadster and coupe. This thing is a Super car. My favorite car! where is the wind shield? what the frik happens if it rains?! This is a nice car, it’s fast and it looks amazing.